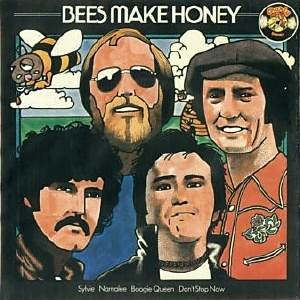 Bees Make Honey were one of the original pub rock groups of the early 70s. Pub rock was the name given to the back-to-basics approach at pub and club level that yielded bands as diverse as Eggs Over Easy and Doctor Feelgood and eventually the cusp-of-punk Eddie & The Hot Rods in 1976. The band's roots go back to early 1960s Dublin and the Alpine Seven Showband, a popular outfit in the pre-beat days, with Deke O'Brien (guitar and vocals) and Mick Molloy (guitar). Barry Richardson joined from another local showband called The Crickets. Barry was an english undergraduate studying in Dublin who played sax and bass. He'd formed an R&B band called Bluesville with another English student named Ian Whitcomb. Members of the Alpines filled out the lineup of Bluesville which is how Deke O'Brien and Mick Molloy became the first Irish musicians to enter the US top 10 in 1965. Bluesville split in 1965, reforming only for a one-off gig in 1966. Barry returned to England after completing his studies. Deke O'Brien went on to The Chosen Few with Robbie Brennan and Brendan Bonass. See the Bluesville story for more details. While in London, Barry played with various bands including a jazz trio and a country-rock band before eventually forming a band in 1971 with his former Alpines bandmates O'Brien & Molloy and noted sax player Ruan O'Lochlainn (aka Ruan O'Loughlin, who wasn't in the Alpines though he seems to have been involved in just about everything else) and an American drummer named Bob Benburg. 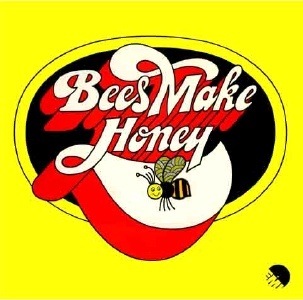 They were christened Bees Make Honey in January 1972 and began playing the north London pub circuit, including a residency with Eggs Over Easy at the Tally Ho. 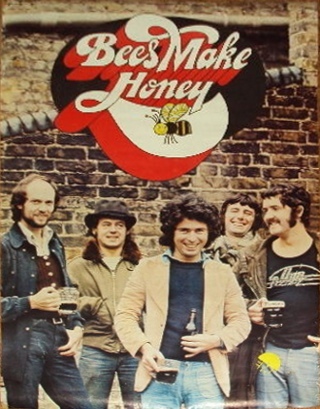 Bees Make Honey were taken on by Brinsley Schwartz manager Dave Robinson (later founder of Stiff Records) and their reputation as a live band in the London area grew to the point where they were regularly being touted as the next big thing. 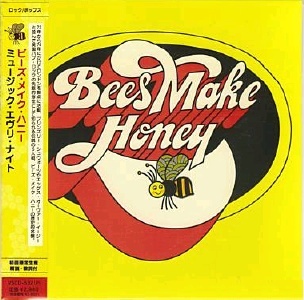 Following some recordings in Rockfield Studios in (late) 1972, they were signed by EMI Records in the summer of 1973. 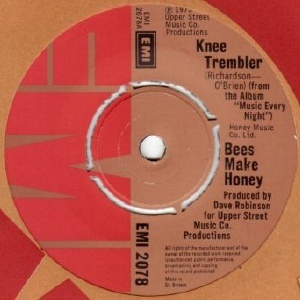 The first single "Knee Trembler" was released and the completed album was scheduled for release that autumn. 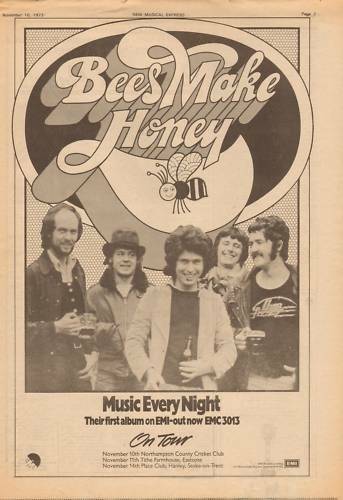 Music press advert for the Music Every Night LP, 1973. At this point O'Lochlainn decided to leave, attempting to form St.James Gate with Johnny Duhan and later forming Riff Raff. He was replaced by Rod Demick (ex Wheels and Demick & Armstrong). Bob Benburg left too, for fame with Supertramp (via St.James Gate), and was replaced by Fran Byrne. Malcolm Morley (ex-Help Yourself) was added as keyboard player. This new lineup toured in support of the album for a few months after which Morley returned to the Man/Help Yourself fraternity. A major split occured in the spring of 1974 when both guitarists Deke O'Brien and Mick Molloy left the band. Their replacements were Willie Finlayson and Ed Dean, while a new keyboard player was found in Kevin McAlea (ex Real McCoy). Dean and McAlea had recently been involved in Brush Shiels first revival of the Skid Row name. Deke O'Brien returned to Dublin where he formed Nightbus and co-founded Scoff Records. 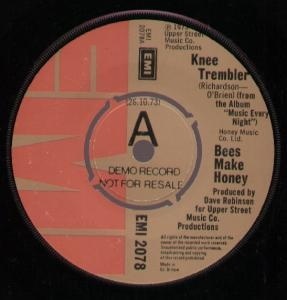 The Dean (guitar), Finlayson (guitar), McAlea (piano), Richardson (bass) and Byrne (drums) lineup recorded a second album for EMI in 1974 but it was rejected by the label and the band was dropped. This album languishes in the EMI vaults somewhere and remains unreleased to this day. They were then taken on by DJM Records for whom they recorded another albums worth of material but this too was rejected! By the end of 1974 the band -- with two albums recorded that year shelved by two different record companies -- decided to break up. Barry Richardson formed his own Barry Richardson Band; Rod Demick and Willie Finlayson later resurfaced in Meal Ticket; Byrne moved on to Ace. Richardson, Molloy and Demick reformed the band a couple of years later with drummer Paul Atkinson. 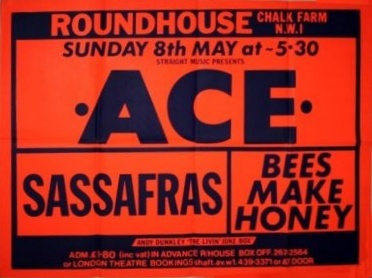 This lineup was recorded live in December 1976 at the Nashville Rooms in London. Four tracks were issued in the Sylvie EP in 1977. The fukk performance is now available as the first disc in the "Back On Track" double-CD set issued in 1996. This band had nothing to do with "pub rock" and everything to do with the West Coast sound with touches of The Band. Covers of the Eagles' "Tequila Sunrise" and The Grateful Dead's "One More Saturday Night" give a good idea of where they were coming from. The other disc in this double-CD set contains recordings from 1971-75, most of them previously unreleased. It includes their first test recording "Livin", featuring Gerry Hogan from Albert Lee's band on steel guitar, and covers all lineups of the band, showing they recorded regularly, though whether any of the tracks come from the unreleased album(s) is unclear. "Music Every Night" itself has yet to be reissued on CD. Notes: Recorded live at the Nashville Rooms in London in December 1976. The full performance was later issued on the Back On Track 2xCD. The lineup is: Barry Richardson (sax/vocals), Mick Molloy (guitar), Rod Demick (bass), Paul Atkinson (drums) and Stan Grieg (piano).